Da Vinci, by Karndean, is a perfect hardwood flooring alternative. Da Vinci is made for any application, whether it be residential or commercial. 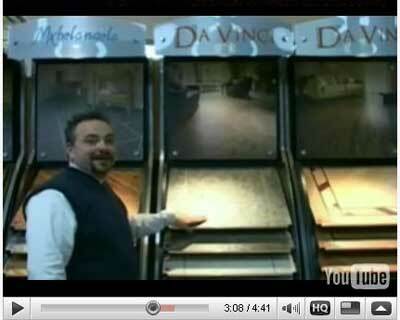 Karndean has perfected the art of scuff protection, and Da Vinci takes this to a new level. 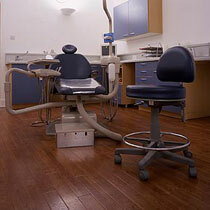 Only basic flooring maintenance is required to keep this floor looking as beautiful as the day it was installed. If you have a flooring problem that sweeping and mopping will not repaire, use Karndean's vinyl treatment products. The decorative borders are complete with angeled edges and a textures surface, making it even more difficult to tell the difference between a Karndean Vinyl Ceramic Tile Floor and the real thing. Each border is complemented with a specific corner design and is made up of a background color (which is the same color as your main floor) and an inset color (chosen as a contrast to create a defined look). Complete the look of your Antique Ceramic floor by adding a decorative strip. Whether you are trying to create a natural grouting effect or personalize a style of your own, a decorative strip is the perfect finishing touch. This Silver metallic strip can add a space age feel to any Da Vinci vinyl plank floor. Silver is available in 3mm, 5mm, and 10mm widths to make your floor your own personnal creation.